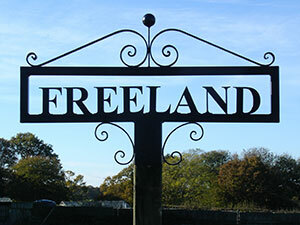 All of our work is manufactured by hand in our forge in Kent, UK. Remember if you cannot find what you are looking for then please do not hesitate to get in touch. Were you choose from one of our thousands of existing designs or a bespoke design, the artwork, detail and animation in our signs is unsurpassed, which, combined with the heavy duty construction and coating creates a top quality sign made with pride and care. So, either choose an existing design from the selection of our previously made commissions illustrated in our sign page. Or, request a modification to one of these designs to personalise it (see price for this option below). Or, if you would like us to design a completely one-off, bespoke or portrait sign, then we regularly work from photographs, sketches and even verbal briefs supplied by you. Click here for more information and examples (see prices for this option below). An arch softens the top of your sign, especially when mounting on top of a post. Add decorative scrollwork, hand forged to match the top of your sign. Have your chosen name hand cut within the frame in place of vinyl lettering. Please note, only readable from one side of sign. Have your chosen name in heavy gauge lettering suitable to the size of sign in place of vinyl lettering. As standard, ‘Times New Roman’ font, bold. Other fonts and styles available upon request. Please note only readable on one side of the sign. A matching hanging bracket with forged decorative scroll for mounting your sign onto a wall or post complete with bolt-through security hanging eye system. Add decorative scrollwork, hand forged to match the top of your blank sign. Have your chosen name in heavy gauge lettering in place of vinyl lettering. As standard, ‘Times New Roman’ font, bold. Other fonts and styles available upon request. Please note only readable on one side of the sign. As per our framed signs, however, your chosen design without the tree surround and frame, primarily for wall mounting. Prices includes wall mounting holes appropriately spaced. Add an appropriately sized solid base and your chosen name in either white or gold vinyl lettering*. Your chosen name can be hand cut. Heavy gauge letters welded on either one or two lines (depending on the name) within an outer frame with matching hot forged scrollwork above, a post top bracket beneath and decorative supporting scrolls all included. As standard lettering to be ‘Times New Roman’ bold, capitals. Any other fonts and styles are available upon request. 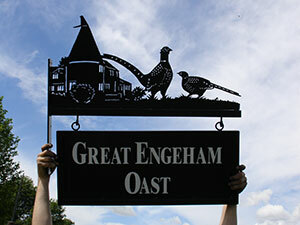 Dependant on final width of sign, - please see plaque prices above for guidance or contact us. A simple frame around a blank design, with your chosen name applied in either white or gold vinyl lettering*. Prices includes wall mounting holes or hanging eyes above (if required). For a completely bespoke design (click here to see how it works) - Usually £83.33 + vat. (£100.00 inc.) (Again, subject to approval). The combination of increasing demand and our ‘individually made to order’ approach (especially with one-off commissions) can lead to a several month wait. However, lead times for any existing design are substantially less, we will also work to meet special deadlines such as Christmas, Birthdays, Anniversaries, etc. Please contact us and let us know. Collection is always welcome FOC. We frequently deliver internationally. Please contact us for a quotation. *The application of vinyl lettering is included in the above prices, applied to both sides of the sign if necessary. Available in white or gold. As standard, ‘Times New Roman’ font, capitals (upper and lower cases and any other font available upon request) Maximum 20 letters. £2.50 per letter thereafter. 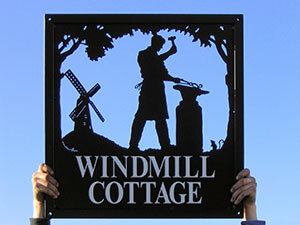 All our signs are individually handmade to order by skilled craftsmen and blacksmiths in our own forge. 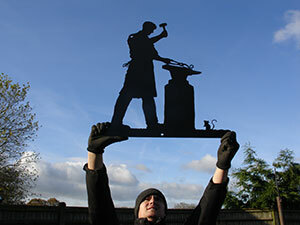 They are fabricated from top quality steel (iron), tig welded and finished to the highest of standards. We take pride in the quality of our work and do not cut corners. Once fabricated, the entire assembly is degreased, shot blasted and galvanised (zinc plated). This is followed by a thick coat of polyester powder, electrostatically applied to the sign which is then baked on in our industrial ovens (i.e. powder coated).This combination of coatings will ensure many maintenance free years. Alternatively, for the absolute ultimate in durability; manufacturing your sign entirely from stainless steel and welding it together with our specialist stainless steel welding process prior to coating it black will give you an unsurpassed, maintenance free sign. 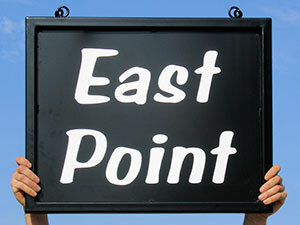 We always recommend a stainless steel sign for coastal locations. Price for this varies depending on your style and size of sign, usually a 30% increase to the above prices. Please contact us for a quotation. Upon confirmation of your order we only ask for a £100 deposit. Following which we will design (if required), manufacture, galvanise (not required for stainless steel signs), powder coat satin black your sign and have it ready for delivery. We are happy to send you a photograph of your finished sign for your approval prior to the balance being due. Contact us now to get the ball rolling (insert family business stuff) with your weathervane. We look forward to hearing from you.